There’s no doubt of the top news story today: plastered all over the web are articles on the acceleration of sea ice melt in Antarctica. Elsewhere news from BP on their analysis of emissions rising again even while renewables surge ahead, Porsche names its new electric car to rival Tesla, an ethical dilemma arising from oil rigs at end of life, warmer waters equal less nutritious fish, and what would happen if there was a mass failure of corn crops around the world. Antarctica has lost three trillion tonnes of ice over the last 25 years – roughly the volume of Wellington Harbour each day – with almost half of the melting happening in the last five years. A major analysis of the frozen continent’s ice sheets and glaciers found the loss has caused an 8 millimetre rise in global sea levels since the early 1990s. 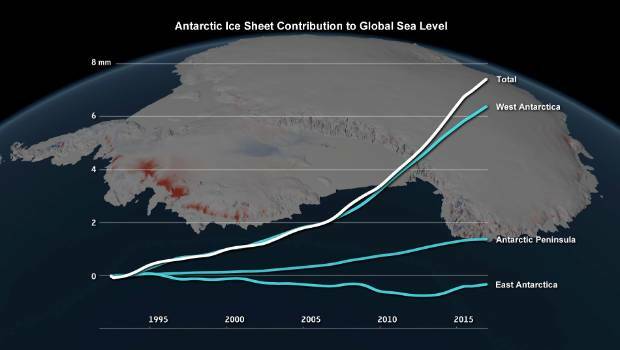 The rate of melting has tripled since 2012, with the 219 billion tonnes of ice being lost every year since then contributing to a 3mm rise in sea levels. The renewed upward march of global carbon emissions is worrying and a big step backwards in the fight against climate change, according to BP. Emissions rose 1.6% in 2017 after flatlining for the previous three years, which the British oil firm said was a reminder the world was not on track to hit the goals of the Paris climate deal. Renewable power generation grew by 17% last year, led by wind and followed by what BP called “stunning” growth in solar. But strong economic growth led to above-average energy demand, coal use bounced back in China and efficiency gains slowed down, causing emissions to jump, the company’s annual statistical review of world energy found. 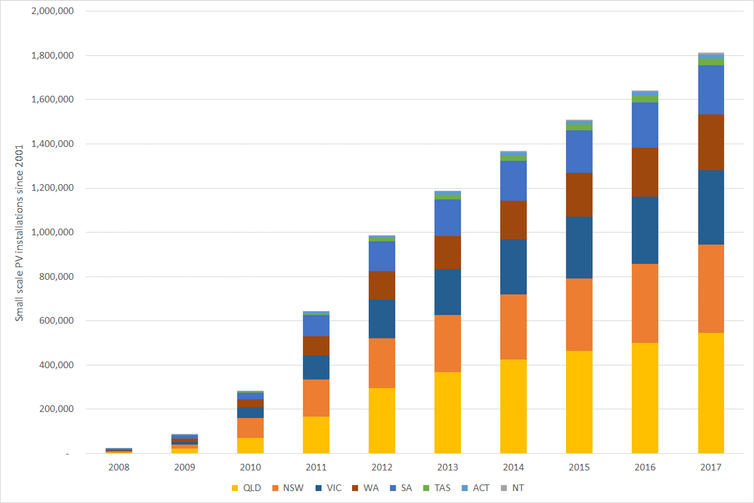 The rate of growth in residential rooftop solar photovoltaics (PV) in Australia since 2008 has been nothing short of breathtaking. Our new research suggests that the households most likely to join in the solar spree are those that are affluent enough to afford the upfront investment, but not so wealthy that they don’t worry about their future power bills. The explosion in rooftop PV uptake since 2008. Derived from Clean Energy Regulator data. Warmer water events can worsen the nutritional balance of fish, finds new research carried out in New Zealand. Conversely, the new study, just published in the Journal of Animal Ecology, found fish and squid caught when waters were colder than normal were of higher quality. Its lead author says the findings have implications for a range of species that eat fish – including us – and highlight another potential knock-on effect of climate change. Australia’s offshore oil and gas structures are starting to come to the end of their lifespans — and while the default is currently to completely remove them from the ocean, some experts believe they should remain where they are. Australia has over 2,000 wells, around 30 platforms and thousands of kilometres of undersea pipeline around its Commonwealth waters. 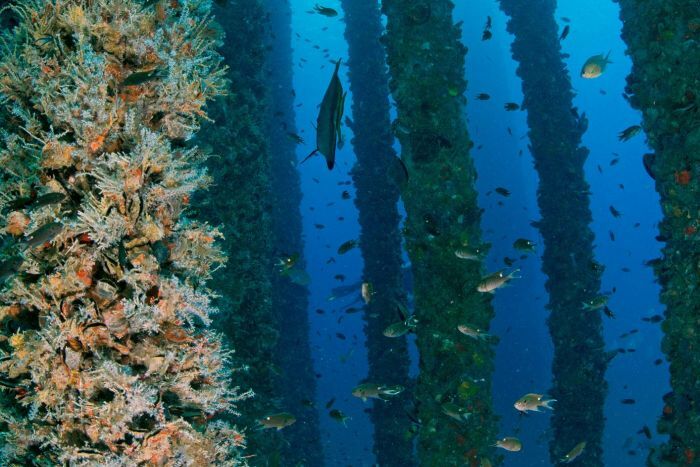 Offshore platforms are effectively huge artificial reefs, according to ecologist Peter Macreadie from Deakin University. AUSTRALIA – At least 136 wedge-tailed eagles were intentionally poisoned last week in East Gippsland, with concerns that more are yet to be found. In the past five years I have used satellite tracking devices to research wedge-tailed eagles’ movements across Australia, and I’ve never encountered raptor deaths on this scale. It’s been suggested that the birds were killed to protect lambs. Tragically, not only was this illegal cull unnecessary – evidence suggests that eagles do not often kill livestock – but it could also have ecological consequences right across Australia. AUSTRALIA – A wombat rewilding program is showing an increase in population numbers, but weather trends, weeds and road dangers are hindering their movement. What began in 2015 with 13 orphaned wombats placed back into the wild at a biobank site at Mulgoa in western Sydney, has grown to an estimated 19 animals. UK – The red squirrel, the wildcat, and the grey long-eared bat are all facing severe threats to their survival, according to new research. They are among 12 species that have been put on the first “red list” for wild mammals in Britain. The Mammal Society and Natural England study said almost one in five British mammals was at risk of extinction. Factors such as climate change, loss of habitat, use of pesticides and disease are to blame, the report said. The report is described as the first comprehensive review of the population of British mammals for 20 years. Macquarie, the Australian bank which last year bought the Green Investment Bank, has issued a £500m loan facility to fund green energy, energy efficiency, clean transportation and low-carbon building projects. KOSOVO – The World Bank is reassessing its support for the only coal power plant project left on its books. The bank was considering guaranteeing loans to the Kosovo C lignite-fired power station, proposed to be built just outside the Kosovan capital Pristina. It was the last exception to a policy against backing coal projects. But on Wednesday, a World Bank spokesperson told Climate Home News it was finalising work on a study of the country’s options for rebuilding its crumbling power sector. ETIFOR provides technology transfer services linking scientists with market players. But Leonardi’s passion project is an ambitious effort to help burgeoning entrepreneurs in the environmental sector. Business is booming in the arena of “nature-based business,” which includes ventures ranging from ecological restoration companies to ecotourism to sustainable commodity production. One study estimates that ecological restoration in the United States is a $25 billion-a-year industry that directly employs 126,000 people and supports 95,000 jobs indirectly — more jobs than logging, coal mining or iron and steel. Porsche, the German sports car manufacturer who made public their commitment to zero-emission vehicles with an 80 foot high pylon of solar panels and an EV supercharger last year, have now officially christened its flagship electric vehicle, the Taycan. The Taycan was first introduced as the Mission E concept vehicle in 2015, and at the time was seen as a possible contender to compete against Elon Musk’s Tesla Model S.
UK – One My Little Pony, two crabbing buckets, five balloons, six balls, seven straws, nine shoes, a dozen coffee cups, 20 carrier bags, 205 plastic bottles and lids, polystyrene and a huge amount of rope. That is just a fraction of what my six-year-old daughter, Ella, and I collected over the course of two days last weekend, as we paddleboarded around the Salcombe-Kingsbridge estuary in south Devon, scouring the foreshores of every creek and cove for 22 miles. NEW ZEALAND – Plastics that were once able to be recycled are now heading straight to New Zealand landfills as China’s waste import ban starts to bite… The Auckland University of Technology is this week telling staff and students not to put plastics graded 3 to 7 into its recycling bins. AUT spokeswoman Alison Sykora said while cans, bottles and some plastics were still accepted, the rest – such as yoghurt pottles or coffee lids – was now rubbish. NEW ZEALAND – From a just-implemented ban on microbeads to new moves to phase out single use plastic bags, efforts to curb plastic pollution have reached an unprecedented pace. But is today’s action decades too late? Jamie Morton asked Auckland University of Technology marine biologist Steph Borrelle. USA – Using the U.S. Environmental Protection Agency’s own numbers, two Harvard scientists have calculated that 80,000 more lives will be lost per decade if President Donald Trump’s administration fulfills its plans to roll back clean air and water protections. The researchers, terming their tally “an extremely conservative estimate,” also estimated that the repeal of regulations will lead to respiratory problems for more than 1 million people. Their essay was published Tuesday in the authoritative Journal of the American Medical Association. Community forestry has long been hailed as a strategy for reducing poverty and improving conservation by empowering communities to manage their forest resources directly, but it is a recent experiment for the DRC. In the two years since the country passed its community forestry legislation, WRI and local partners such as CODELT have rolled out a series of pragmatic tools and guidelines to help communities and authorities navigate the application process. Depending on where you sit, Hawaii’s latest climate aspirational declaration that as of yet has no clear path forward — to become carbon neutral by 2045 — may seem either preposterous or prescient. But whether you’re optimistic or pessimistic about the outcome, the action sends a clear signal to both consumers and businesses: Hawaii is serious about decarbonizing, and in a way that doesn’t penalize the local economy. Everything we buy has a carbon footprint and food is no exception. Yearly, we produce five billion tonnes of carbon dioxide equivalent from crop and livestock production. From seed to mouth, it can be easy to forget how much in terms of production goes into our food. So here’s a couple of things you may not already know about the carbon footprint of your favourite dishes. Climate change will increase the risk of simultaneous crop failures across the world’s biggest corn-growing regions and lead to less of the nutritionally critical vegetables that health experts say people aren’t getting enough of already, scientists warn. Two new studies published Monday in Proceedings of the National Academy of Sciences look at different aspects of the global food supply but arrive at similarly worrisome conclusions that reiterate the prospects of food shocks and malnutrition with unchecked global warming. While developing tropical countries would likely be hardest hit, the destabilizing financial effects could reach all corners of the globe, the authors say.